Every great room needs a variety of elements to create that powerful impression. We believe the impact of fabulous antique mirrors cannot be equaled. That being said, and under the heading “design is in the details,” it is our mission to motivate our customers to include unique antique elements in every room, starting with the antique mirror. Decorative antique and vintage accents will add depth and personality to all styles of interior design. Contemporary interior design will always be enhanced with the addition of well-chosen antique mirrors and accessories. Our favorite decorative accent is undoubtedly the antique mirror. Not only does it add a striking focal point, the mirror also adds the element of light to a room. One must always consider the image that is reflected in the mirror when placement is chosen. When the antique mirror is thoughtfully placed, not only is the mirror beautiful, but the image within the reflection expands the beauty. Our inventory includes wood framed antique and vintage mirrors in all finishes, including gold leaf, patinated silver and stained wood as well. Venetian mirrors of solid glass, chinoiserie frames, pierced brass frames, antique trumeaus, tall pier mirrors and miniature mirrors perfect for the small space are all represented in our vast inventory. Delicate and beautifully etched, hand blown antique crystal stemware sets a fabulously interesting table. Mid-century cocktail accessories including martini shakers, corkscrews, stoppers, olive forks, ice buckets, liquor highball glasses, stemmed martinis and wonderful antique decanters can be found in our shop. Porcelain dinner and dessert sets, silver plated engraved hollow ware and serving utensils are also included in our inventory. We are huge fans of the formal table and the well-stocked bar. Long before the recently intense interest in Asian decorations occurred, we had been buying and selling the most amazing Asian artifacts. They give a room such an exotic impact, especially the larger pieces that can be a show-stopping focal piece. What room wouldn’t benefit from a fabulously showy pair of bronze foo lions? Or from a delicately enameled cloisonné vase placed on a carved Chinese base, full of brilliant color? The European chinoiserie style is a favorite as well. Our inventory includes chinoiserie mirrors, lamps, boxes and furniture. We like Asian accents so much that we even carry new carved jade finials for lamps. Lastly, the shop is bursting with a lively and unique collection of decorative accents from France, Italy, Portugal, England and the United States. 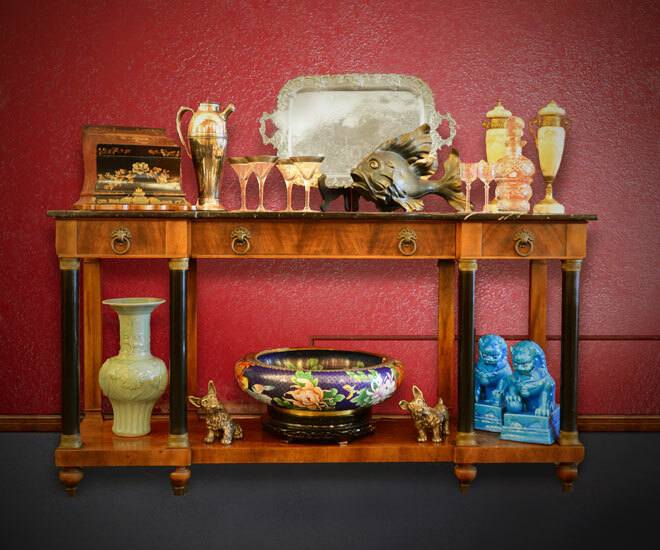 Included in our inventory are hand made boxes, candlesticks, girandoles, vases, umbrella stands, trays, bronze, brass and spelter figurals, porcelain birds and dogs, and framed art. We simply have too vast an inventory to list all of the selections. Our choices are based on workmanship, function and esthetic value.